Hello everybody! How was your october? November has started. So time for a brand new Dailystills. Fall is definitly here now. I'm planning to go to the woods a lot, love it there during this season. There are a couple of cozy warm things to take pictures off and lots of stuff you can do outside! 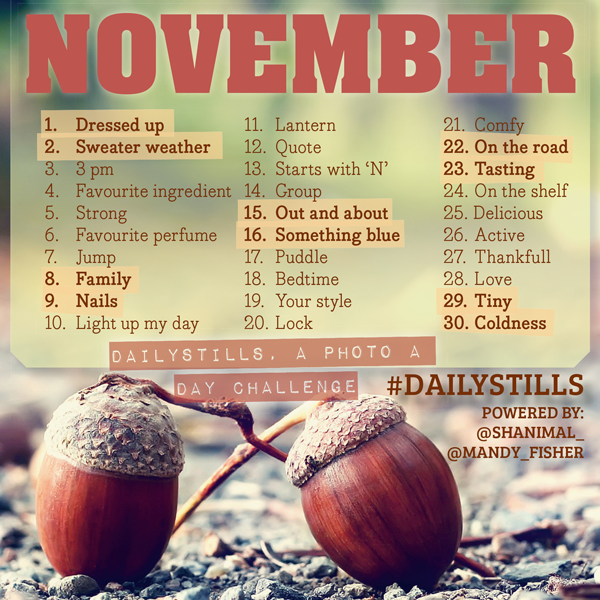 Enjoy this November Dailystills. Are you joining us in November? Let us know on Instagram :) My IG account @shanimal_ and Mandy: @mandy_fisher. You're allowed to save this photo and share it on Instagram too, enjoy! ♥ Take a photo using the prompt as inspiration. So for October the prompt for day 1 is ‘Dressed up. So take a photo when you're 'bout to go out, when you are dressed up to work out, whatever you are dressed up for!